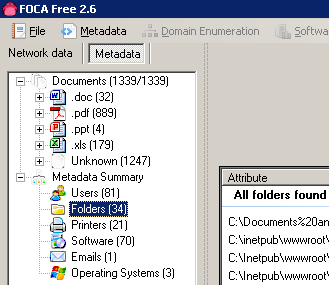 The terrific guys at informática64 put together the FOCA tool (for mostly automated metadata extraction in the free version) quite a while ago and they just keep improving it continously. The Pro version is just 100€ + VAT and you get a lesson from Chema Alonso along the way so worth considering too :). I recently heard on the Spanish version of the PaulDotCom podcast that the tool name "FOCA" ("Seal" in Spanish) comes from the guy who first implemented the tool at informática64. 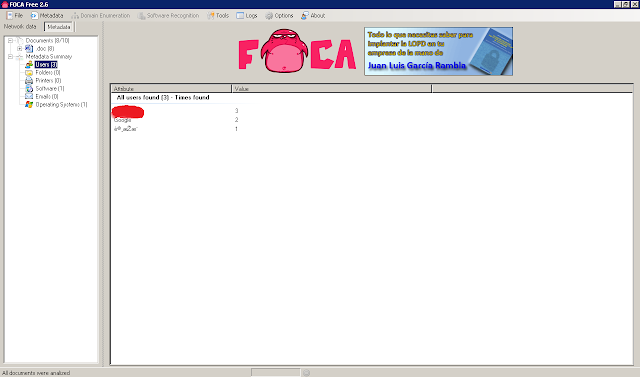 His name is "Fernando Oca" and his username was logically "Foca". This led to a lot of healthy jokes at informática64 and the tool name was inevitable :). The version used in this tutorial will be FOCA Free 2.6.1.0 (the free version has significantly less options but it is still very useful). They are going to release version 3 soon (Spanish) so I might publish another tutorial in a few months, when the tool will be significantly improved as they say. 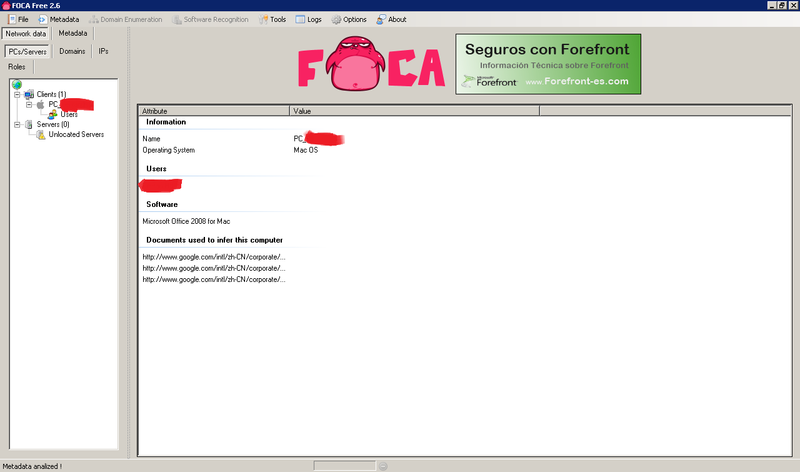 The first step when using FOCA is to choose your search type, you can choose "site:target.com" or "site:target.com filetype:doc", etc. When you have a bunch of sites as I did in a recent test I like to use: site:target1.com OR site:target2.com ..... and if they are not very big do not specify a filetype: This will return everything, including web pages, which you can analyse later for HTML comments, etc too. The metadata identifies 3 potential users as well as 1 software package in use and an operating system. Now let's look at information from the field. What can you really find in a normal pen test? The servers and printers usually contain very interesting correlated information like for example which users had access to each printer or server. 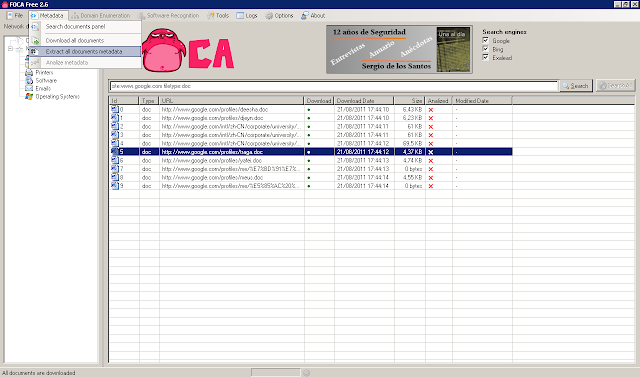 You can tell apart the FOCA files from the rest quite accurately based on the download timestamp. A minor issue, particularly when many domains are used at once is that files like index.php will be created as "index(1).php", "index(2).php", etc. Then it takes a bit of work to figure out which index.php belongs to each domain. 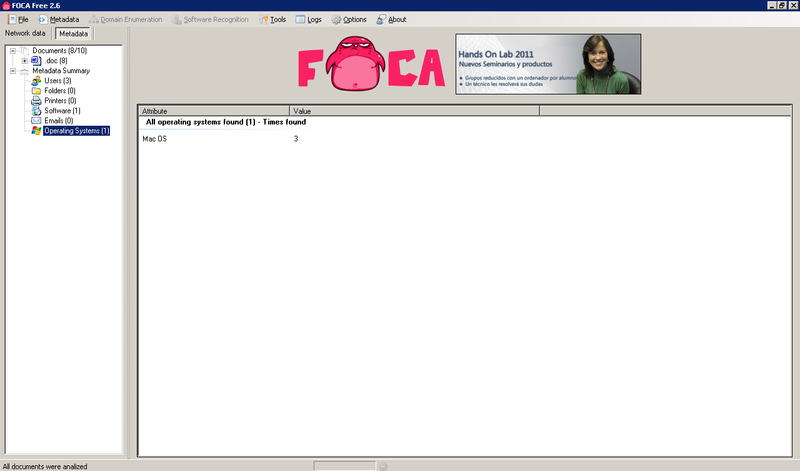 The true power from FOCA comes from the automated "even my grandma can do it" metadata analysis, including correlation by user, server and printer.